GWALIOR. DEC.21: The Homoeopathic Association of India, Madhya Pradesh State branch organized the 17th National HMAI seminar at Tagore Auditorium, Laxmi Bai National University of Physical Education. 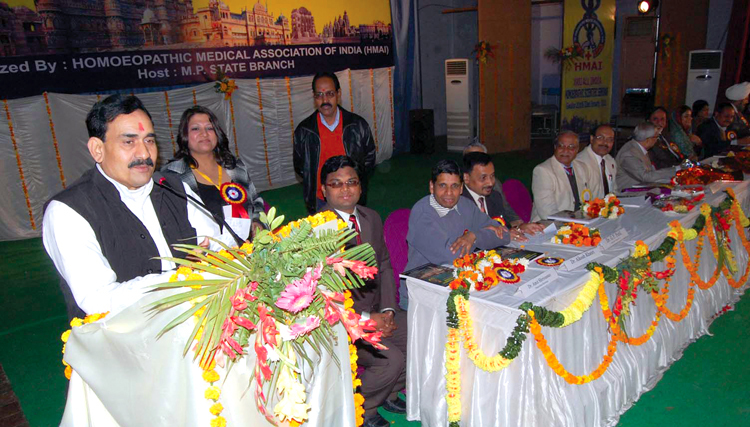 Hon’ble Minister Dr.Narottam Mishra was the chief Guest and he inaugurated the seminar. He also released the souvenir. Smt Samiksha Gupta, Mayor, Gwalior Municipal corporation, Dr.D.P.Lokwani , Vice Chancellor, Medical University, Jabalpur; Dr.Jai Singh Kushwah, Chairman SADA, Gwalior, Dr.S.P.S. Bakshi, Former President, Central Council for Homoeopathy, Dr.Arun Bhasme, Vice President, Central Council for Homoeopathy Dr.V.C.Acharya, President, HMAI were the Guest of Honours. Dr.J.S.Khannan, former President, HMAI, Dr.M.P.Arya, Dr.Dhariyani Dr.Bhaskar Batt, Deputy President. Dr.Shymal Mukaarjee, Secretary, HMAI, Dr.C.P.Patil. President, M.P.Sate branch, Dr.Alkesh Katri General Secretary M.P.State, Dr.Jagadish Salil, Chairman, Organizing committee, and Dr.Amit Srivastava Secretary, Organising committee also participated.